Staff were brilliant and made us very welcome. Daniel was especially helpful. When would you like to stay at YHA Wye Valley? Set in 25 acres on the banks of the River Wye, YHA Wye Valley is great for activity breaks and adventures in this magical section of the Welsh borders. It even has its own canoe landing station! Located in the heart of the Royal Forest of Dean, close to Symonds Yat Rock, there's a course on site for orienteering holidays and there are miles of footpaths and trails to explore for walkers and cyclists of all levels. There’s also an extensive range of camping and glamping options to enjoy, too! Both dorms and private rooms are available at this Youth Hostel, along with lounge and dining areas. There are two lounge areas for our guests to relax in, a dining room and an outside seating area for dining or relaxing when the weather is fine. Get all the fun of camping but without any of the set up stresses with these beautiful bell tents - part of the YHA Glamping experience. These spacious tipi-like tents are fully kitted out with a double futon bed and three single futons plus all bedding and can sleep four/five people. They also have eco-friendly solar lighting and comfy bean bags for you to chill out on during the day plus bedside tables, a coffee table, rugs and soft flooring. Premium bell tents also have the added benefit of a woodburner to keep you cosy. 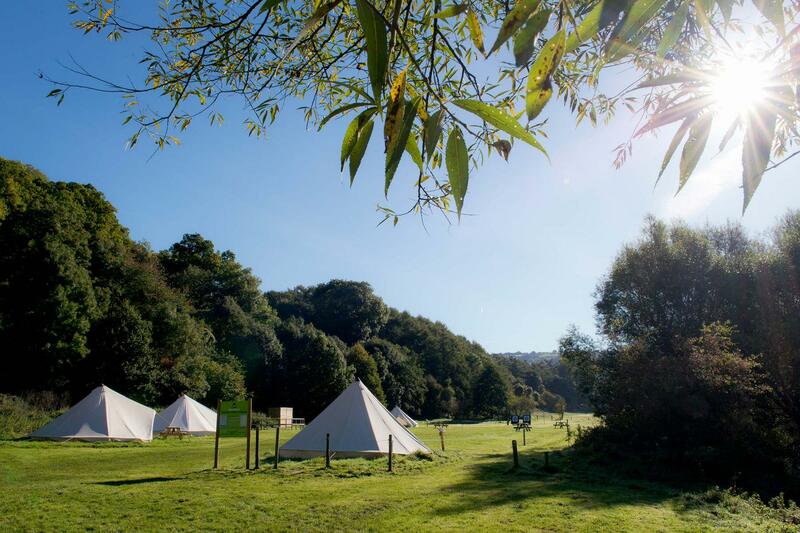 There are six bell tents available at YHA Wye Valley - four standard and two premium. YHA Wye Valley's bell tents are available to book for stays between May and September. The campsite is a spacious field on the edge of the Youth Hostel grounds in close proximity to the River Wye and the on-site canoe launch - perfect for a watersports holiday! For guests with smaller children, or if you wish to be closer to the facilities, there is an additional camping field situated directly below the main building. The campsite is a great location for both organised groups and family holidays. It is a perfect stopover for canoeing the Wye or as a base for a canoeing break. YHA Wye Valley has a restaurant and also hosts BBQ nights. On site activities include archery and family fun nights. A water supply is provided on the camp site as well as a designated fire pit/barbecue area for campers' use and picnic tables. There is 24 hour access to toilets and showers. The separate male and female WC blocks are located in the main courtyard. Campers are welcome to use the self-catering kitchen and seating area during open hours and there is a sink for washing up in the courtyard. 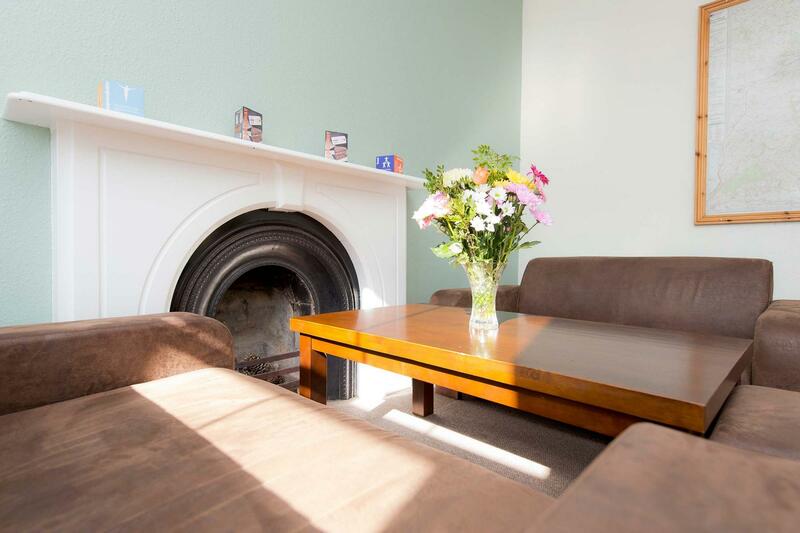 Campers are welcome to use the main hostel lounge facilities. During periods of dry weather, you can drive your car down to the camping field and park next to your tent. However, when the ground is wet access to the campsite may be more difficult and so there is a car park approximately five minutes' walk away. All campers must check in before 10.00pm and check out by 10am. Later departure is available by prior arrangement, please contact YHA Wye Valley directly for details. 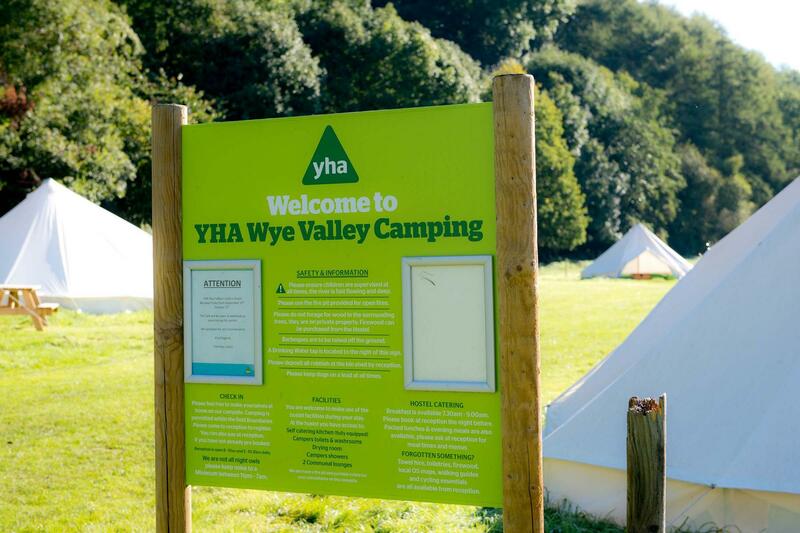 Please note that during sole use of YHA Wye Valley by school groups, the campsite is not available for use except for other school/educational groups. Advance booking is advised. No ground level fires or non-raised barbecues are permitted anywhere else on the campsite other than the designated fire pit, due to health and safety reasons. Campers are not permitted to bring their own alcohol on site but there is a bar in the main Youth Hostel which they are welcome to use. There is a tight hairpin bend on the main driveway and so cars towing trailers may need to detach the trailer to go round the bend. The access to the site is not suitable for any vehicle larger than a small minibus. It is therefore not recommended for camper vans. Symonds Yat is one of the best areas for climbing. High wire fun in the forest – climb rope ladders, zip wire through the trees and tackle high wire rope bridges. Just downstream from a small set of rapids, marking the start of a beautiful section of the Wye, there's 100 miles of canoe-able river. YHA Wye Valley is perfect for walking holidays. The hostel is on the Wye Valley Walk, a very popular walking trail through the Welsh borders and the limestone valley. The Forest of Dean is a great place for mountain bikers of all abilities. The Forest of Dean and the Wye Valley are great for cycling. There are many routes depending on your requirements. YHA Wye Valley is the perfect stop off point if you're paddling from Hereford to Monmouth. The hostel even has its own canoe launch next to the riverside campsite. Parking: YHA Wye Valley has free parking on site. The hostel is situated 1.5 miles from the nearest village and the wonderful, unique location of the place is part of its alluring charm. Please be aware that it can only be reached by a single track lane, the last 800 metres of which are narrow and steep with a sharp bend and an uneven road surface. It is accessible to all cars, vans and minibuses but coaches and larger vehicles will need to arrange alternative drop off points direct with the hostel. Open every day? : From 1st March to 31st October YHA Wye Valley is open during weekends and school holidays for families and individual travellers. From Monday - Thursday the hostel is open for group bookings. From 1st November until 28th February YHA Wye Valley is open for group bookings and YHA Exclusive Hire. Beds and rooms may become available three months prior to the travelling date so please check the website for more information. Pets: Dogs can stay on our campsite and in our bell tents. There is a £5 charge per dog per night for our bell tent accommodation which is payable upon arrival. You can bring your dog for free if you are camping in your own tent. Pets are not permitted in the hostel accommodation at YHA Wye Valley however, assistance dogs are welcome throughout, please advise upon booking. Invite all your family and friends along to YHA Wye Valley and hire the whole property to yourself. To do so visit the YHA Exclusive Hire website. Open for bookings from the autumn half term to the Easter holidays. YHA Wye Valley is a brilliant place to visit for an active, outdoor education-led school trip. Set in the centre of 25 acres of land on the banks of the River Wye, this hostel is primed for activity breaks - it even has its own canoe landing station! 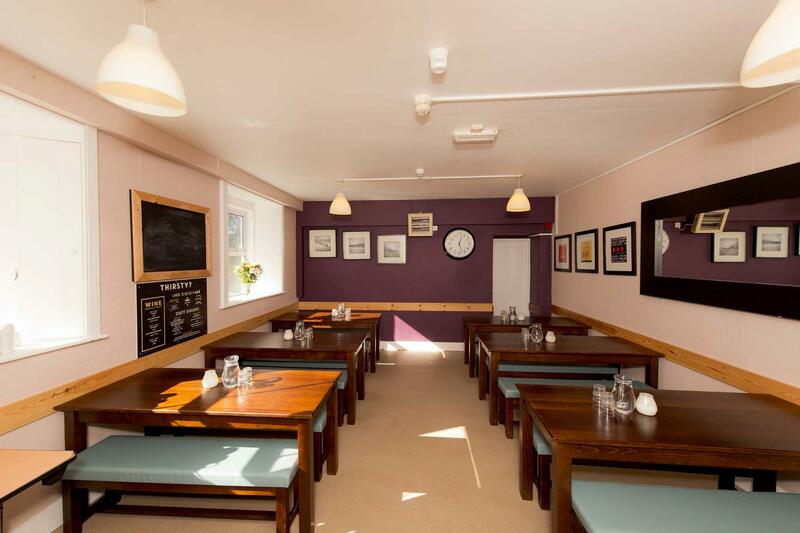 The hostel has room for up to 78 people, provides meals, a library and a lounge.